Sweet, rich and creamy with a flavour that bursts on your tongue this is definitely the most divine strawberry ice cream you will ever taste. Summer was the most delightful time of year to me as a child. School would be on the verge of breaking up plus there was the growing excitement on the school run of looking out for the P.Y.O. Strawberries sign. 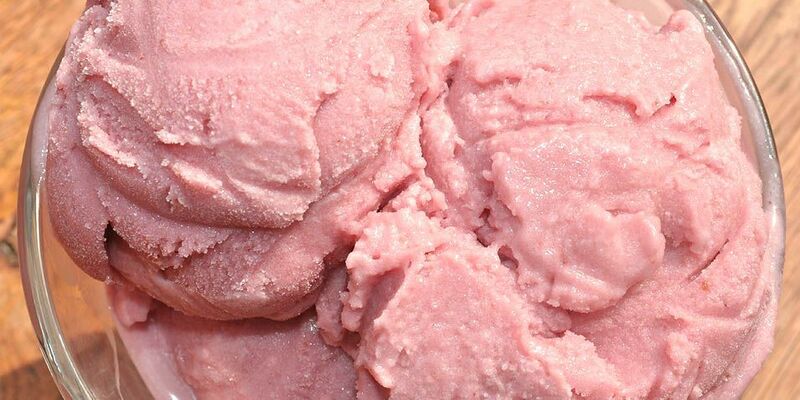 Not only did I LOVE strawberries but it was a surety that our first batch would be turned into a gallon of my Mother's Simply Scrumptious Strawberry Ice Cream (yes that was its official title!) There was no strawberry ice cream in the world like it, each mouthful was creamy delicious and bursting with strawberry flavour. So as strawberries came into season this year I couldn't help but wonder if I could make a healthier version of this divine treat. The secret to the depth of the strawberry flavour, I have discovered, is in the process. Half the ingredients is cooked - the other half raw thus keeping the lovely freshness of the strawberries. 1) In a saucepan add 1/3 cup of Agave Nectar to 1 3/4 Cups (1 can) of coconut milk and place over a medium/high flame for about 10 mins. Be careful not to take your eye off it, coconut milk can boil over in a blink so make sure to whisk periodically to prevent this happening. 2) Add 2 tsps of Arrowroot Powder and whisk thoroughly. Simmer on a medium/low heat for a further 5 mins stirring constantly. The mix will start to thicken – remove from heat. 3 ) Alongside chop and hull half of the strawberries and simmer on a medium/low heat with 1/3 cup of agave nectar. Make sure to stir from time to time to prevent the mix sticking and burning. After about 10-12 mins the mix will thicken into a strawberry sauce. Remove from heat. 4) Blend the remaining strawberries with 1/3 cup of agave nectar until smooth. 5) Add all the ingredients together in the blender and blend until smooth. Optional: you can hold back 1/3 cup of cooked strawberries to stir in later. 6) Place in a dish (I use a bread loaf tin) and allow the Ice Cream mix to cool thoroughly. I don’t have an ice cream maker so here is what I do to create really smooth creamy ice cream. Once the mix has cooled thoroughly place in the freezer overnight. The next day, once the ice cream is frozen completely, remove from the container and chop into pieces. Place into a blender and blend until smooth. The mix should be a bit like soft whip ice cream when you’re finished. If you held back 1/3 Cup of strawberries you can mix them in now. The more solid ice cream will hold them in place. Place back in the freezer for 2 -4 hours before serving. *I've also tried this recipe with maple syrup and honey - they've all worked really well!